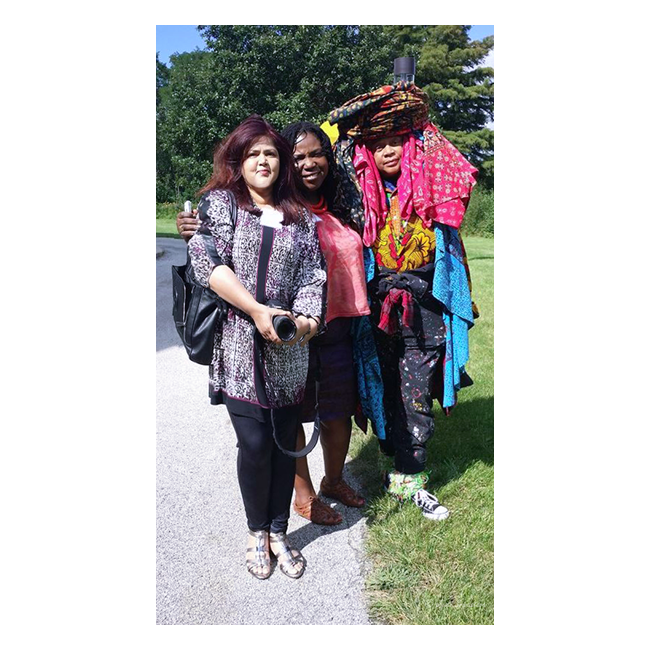 Above Image: Sculptor Chakaia Booker, Deputy Commissioner DCASE Tracie D. Hall and me. Where DCASE is Department of Cultural Affairs and Special Events, City of Chicago. Photo by Jeff Stevenson, who works at the Nathan Manilow Sculpture Park. 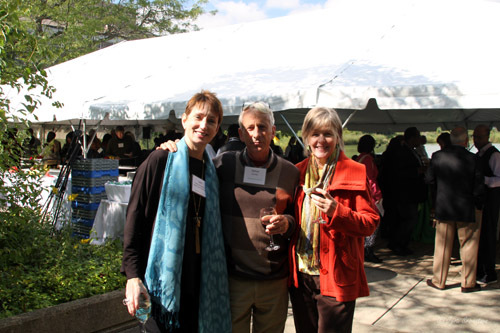 An annual benefit fundraiser at the Nathan Manilow Sculpture Park at Governors State University. 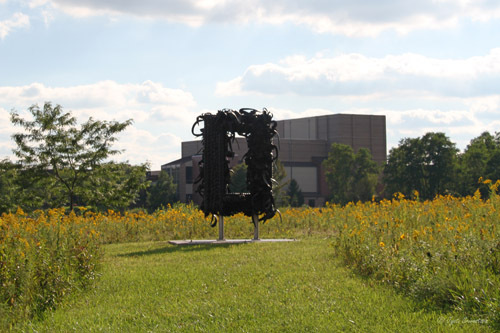 One of the most beautiful sculpture parks, is the campus of Governors State University [GSU], the Nathan Manilow Sculpture Park , with about 30 outdoor large scale monumental sculptures. GSU was formed in 1978. 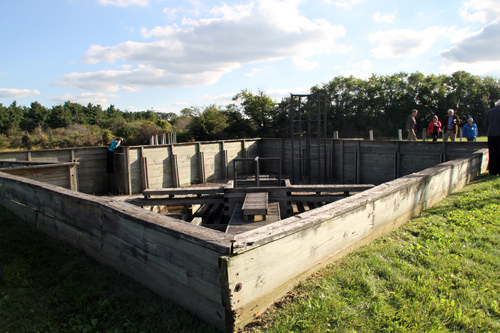 The sculpture park predates GUS, in that the sculptor Mark di Suvero spent the summers of 1968 and 1969 living and building the sculpture, “Yes! for Lady Day” on this land that later become the university. However, the park was formally named as the Nathan Manilow Sculpture Park only in 1978 by the GSU Board of Trustees. 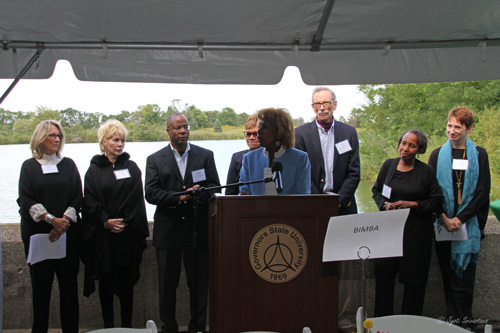 Jacqueline Lewis, President, Board of Nathan Manilow Sculpture Park.. standing are other Board members. Carts & Cocktails is an annual benefit fundraiser for the Nathan Manilow Sculpture Park. The 2014 Carts & Cocktails event celebrated three sculptures in particular: Field Rotation  by Mary Miss, Yes! for Lady Day [1968-69] by Mark di Suvero and Serendipity  by Chakaia Booker. The event 2014 Carts and Cocktails, began with the welcome speech by Jacqueline Lewis [President, NMSP Board]. 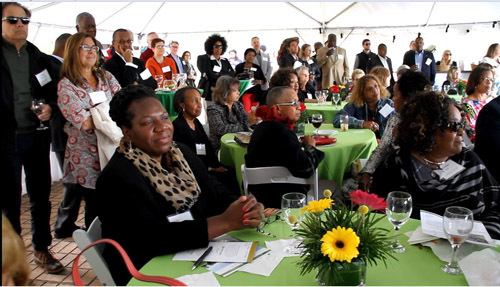 Other speakers included Susan Ormsby [Immediate Past-President and Event Chair], Elaine P. Maimon [President, Governor State University], Jeanne Bridges [US Head, Diversity and Inclusion, BMO Harris Bank] and Geoffrey Bates [Director and Curator at NMSP]. The program was hosted by Stefan Holt, from NBC 5 News Today. We have here a concept, vision and strategy of living in the midst of art. Yes we want all our students, faculty and staff to go to museums and take advantage of the great cultural setting that we have in Chicagoland. But, we also want everyone, no matter what the student major, no matter what the employee job, to understand the inspiration of having art around us…. We have here this amazing sculpture park, which is our campus. Our campus is our sculpture park, our sculpture park is our campus. Its one and the same thing!. – Elaine P. Maimon, Ph.D.[President, Governors State University]. 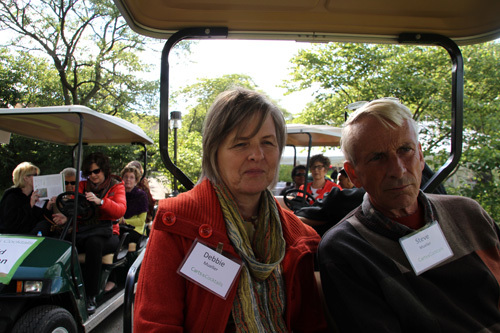 There is three-fold mission of the park: education, exhibition & acquisition and conservation. We provide here the chance to experience exceptional work of art, by men and women who have distinguished themselves in the field of sculpture. We will shortly travel out in the prairie, where art and nature have been woven into a seamless transition. 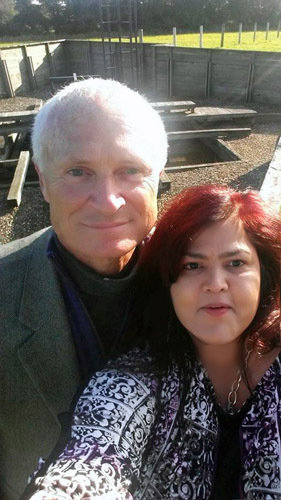 – Geoffrey Bates [Director and Curator of Nathan Manilow Sculpture Park]. From left: Lee Elizabeth Kelley, Steve Mueller and Debbie Mueller. Yes! for Lady Day [1968-69] – by Mark di Suvero. 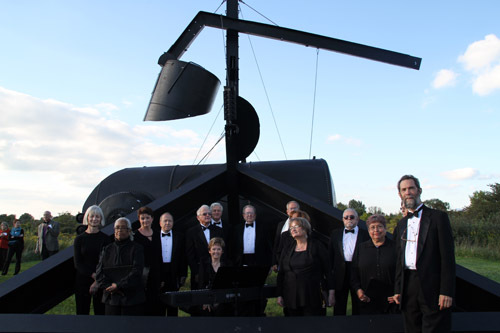 The evening was marked by superb performance by the Chorale singers, seen here in front of the sculpture. One of the main highlights of the evening was the solo exhibition series, “Don’t Tread on me” – by special guest artist Chakaia Booker. This is the 4th in the Solo Exhibition Series presentation at the Nathan Manilow Sculpture Park. Since their inception in 2009, these presentations of exceptional artwork by nationally and internationally recognized artists have been generously supported by BMO Harris Bank. The first of the solo exhibition series was 12-figure installation “Horizons” by Icelandic sculptor Steinunn Thorarinsdottir . This was followed by “Neil Goodman in the Park”  and Sophie Ryder’s “Upside Down, Kneeling” . The 4th solo exhibition, “Don’t Tread on Me: Sculpture by Chakaia Booker”  consists of three outdoor pieces: Serendipity , Meeting Ends  and What’s Not . These works from different times in her career suggests her creative range. 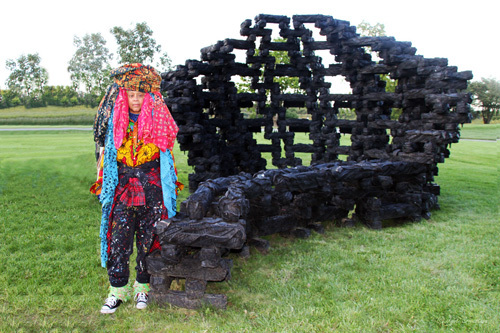 Chakaia Booker is best known for her work with discarded automobile tires, which she cuts into pieces of varying length, width and shape – and fastens onto wooden or metal armatures. She builds indoor and outdoor sculptures raning in scale from intimate wall pieces to large public works. Official Website: Nathan Manilow Sculpture Park .. .. click here..
My Posts on Nathan Manilow Sculpture Park.. click here.. 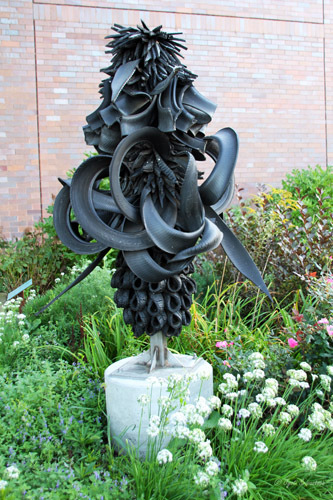 Temporary Exhibitions: Nathan Manilow Sculpture Park.. click here..